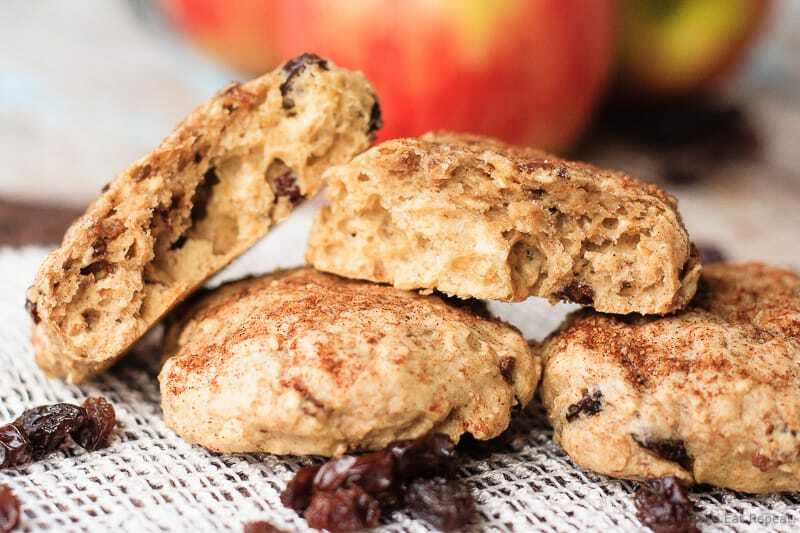 Soft apple oatmeal breakfast cookies that are a hit with the kids! The perfect healthy snack for the lunchbox, or as an on-the-go breakfast! I’ve mentioned before that I am constantly on the look out for snacks for my kids. Lunches, after school, on the run…they are constantly hungry. Enter breakfast cookies. The healthy snack/breakfast that masquerades as a treat-like cookie. I mean, not to me. This cookie isn’t really my idea of a cookie, I will certainly admit. When I crave a cookie, it’s generally something a little more on the unhealthy end of the spectrum. Usually involving chocolate. Definitely involving more butter and sugar than is good for me. Something more along the lines of these Triple Chocolate Macadamia Nut Cookies. Or these Salted Caramel Chocolate Chip Cookies. Because those are cookies. 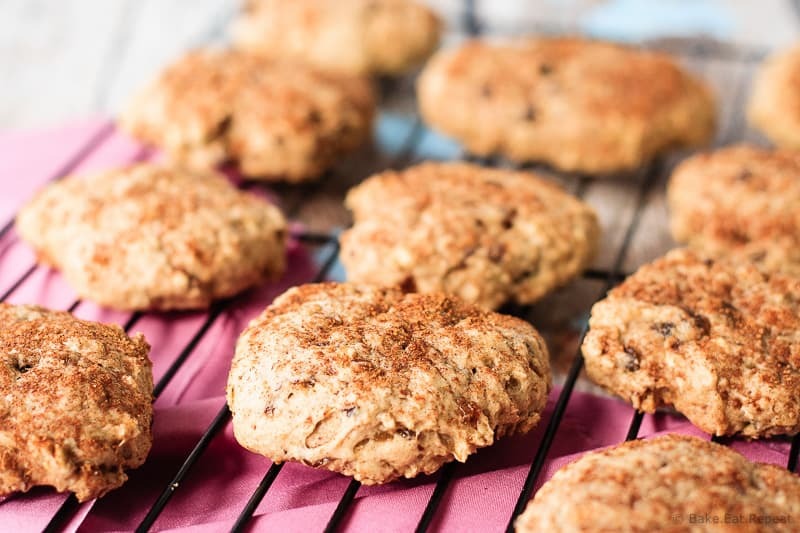 Lucky for me, I somehow managed to have kids that think these apple oatmeal breakfast cookies….are cookies. Don’t get me wrong, they’re certainly tasty, but I think they’re a bit too cake-y to be an actual cookie. Or maybe they’re just a little too healthy? That could be it. These are definitely healthy, and are worthy of the title of breakfast cookie. You most certainly could have one for breakfast and not feel even the least bit guilty. It would even fill you up reasonably well, what with all the oats and apples and whole wheat flour in there. 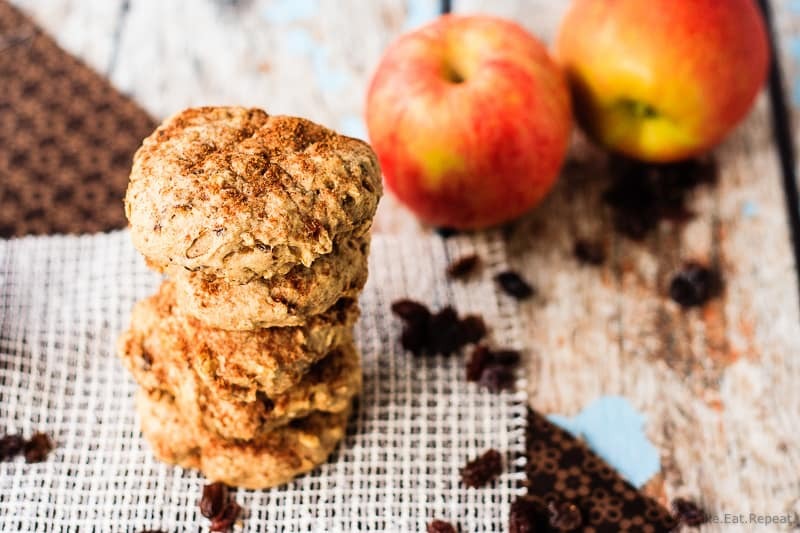 Tasty, hearty, healthy, full of apple cinnamon goodness – these breakfast cookies are the perfect snack to throw in the kid’s lunch boxes, or to grab as we run out the door. They absolutely loved them, and begged for more. I don’t really understand. Cake-y cookies just aren’t my thing I suppose. But I’ll take it – it’s awfully nice when they happily eat the healthy snack and call it a treat! Maybe I’ll just have one for breakfast. I could get on board with that. Just don’t call it a cookie. Unless my kids are around. 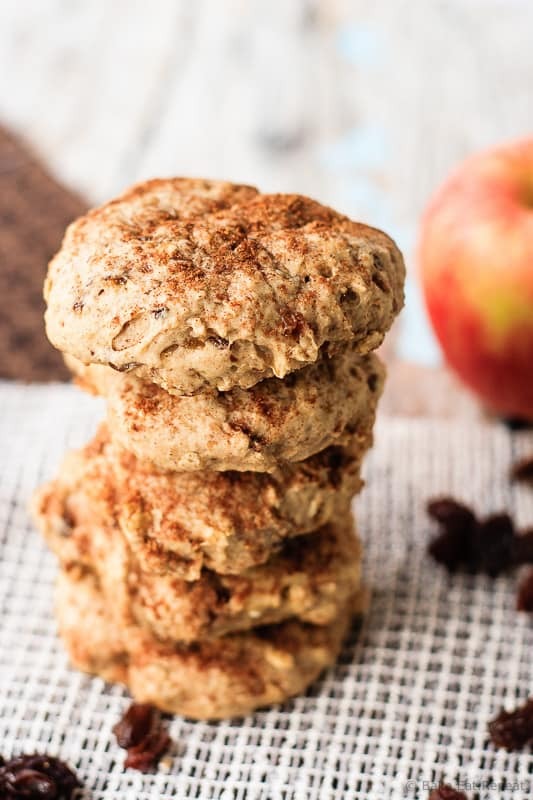 I’ve also shared these Apple Oatmeal Breakfast Cookies over on Food Fanatic. This recipe is on Food Fanatic, and they have nutritional info on their recipe card, it just doesn't show up on the embedded recipe. Click "print" on the recipe on my site and it will open up on Food Fanatic for you with just the recipe card and the nutritional info for the recipe is at the bottom of that card. Can I use old fashioned quick oats instead of the rolled oats? I think that would be okay, although I haven't tried it myself! Let me know how they turn out if you try it! Hie can you please tell me the substitute of egg. Hi Neha - I have never made these without eggs. If you google "what to substitute for eggs" you can find a lot of resources that will give you various substitutes. That would be the best place to start. A lot of people use "flax eggs" in place of eggs in baking, which is 1 tablespoon of ground flax seeds mixed with 3 tablespoons of water until fully absorbed, in place of one egg. Having never tried it in this recipe though I couldn't say for sure how that would turn out. Good luck! If I don't have wheat flour, could I just double up on the regular flour? Yes you can just use all purpose flour instead. Hope you enjoy them! Could the flour and the whole wheat flour be replaced with coconut flour and rice flour or something else for gluten free cookies? Hi Karen, I haven't actually used coconut flour or rice flour myself so I couldn't say how they would work in this recipe. From what I've read about them they absorb different amounts of liquid then wheat flour does so the cookies wouldn't end up the same. I think if you want to make them gluten free you would have better luck with a gluten free flour blend, but as I've never tried it I couldn't say for sure that they would turn out. If you decide to try it out, let me know how it goes! These cookies are delicious! The whole family loved them. I'm making a second batch today. Can I use oat bran instead of rolled oats (can't seem to find it anywhere)? Will it still be moist? I think oat bran would make the cookies drier as it would absorb more liquid then the regular oats do. Rolled oats are just old fashioned oats, they're usually with the cereal at the store along with all the other oatmeal, not with the baking products like flour. Quick oats would likely work just as well if you have those. Can the apple skin also be shredded, or is it just the flesh? I'm looking forward to making these; they sound not only nutritious, but delicious! Plus, it's faster! :) I can never be bothered to peel apples, especially when grating them - and extra fiber is always good! Hope he likes them! do u have any nutritional info on cookies? Hi Megan, I don't actually calculate the nutritional info on my recipes, but there's lots of online nutrition calculators that you can enter the ingredients into and it'll calculate it for you. And actually, since this particular recipe was shared over on food fanatic, you can head over there (here's the link) as they post the nutritional info for each recipe. I am the worst when it comes to breakfast. I find myself skipping it more than I'd like to! I love that you can make these ahead of time and just have them all week! haha yay for treats which are actually healthy! You are awesome at this Stacey, looks yum! Thanks Manali! I just like to try and trick my kids! :) We'll see if it keeps working as they get older! Cookies for breakfast!! YES!! This is my kind of breakfast. :) I'm really just a big kid at heart, though. Love the fall appley flavor! Cookies for breakfast?! I am so about that (even if they are healthy )! I am all about being able to grab breakfast on the go! Thanks for sharing! I love breakfasts on-the-go! I need to make a batch of these cookies! You have really mastered the art of snacks that sound like dessert! And look like dessert! And probably taste like it too. :) These look delightful! Well I have kids that I like to try and trick with "treats" that are sneakily healthy! So far it's working - although I'm guessing it'll get harder as they get older! Thanks Sarah! My daughter has recently been skipping breakfast which I am not happy with (she would always eat it!) I think it has to do with the fact that school is part of her life now and she is so anxious to get out the door. I would not feel bad at all sharing these with her for breakfast; they sound so good! Yeah, my kids are always anxious to get out the door for school too. Luckily we don't need to leave too early so they generally don't have too much trouble getting breakfast in! I do like having something like this on hand for those mornings we're running late though! Thanks Kacey! I wouldn't think twice about giving these to the kids for breakfast or a snack! Love the fall flavors!